Last Updated: September 27, 2016 | Subscribe to our weekly newsletter! Gas pool heaters can be the perfect way to warm your water when it temperatures start to drop outside. But nothing can end your cool weather swimming seasons quicker than a faulty gas pool heater. However, there are many things you can do to troubleshoot your gas pool heater yourself without the need to call in a professional. Let’s take a look at many of the most common issues you may run into if you own a gas pool heater and what you can do to fix them yourself. I think the best way to look at how to troubleshoot your gas pool heater is to break down some of the most common problems you may encounter and what you need to do to fix them yourself. This is one of the most common problems you will experience and some time or another. There are many possible causes. If your heater won’t ignite, first check to make sure the heater switch is on and the thermostat is set to a temperature that is higher than the water temperature. Once checked, double check that the pilot is lit and the gas supply valve is in the on position. If your pilot won’t light, you could have low gas pressure on your heater, or maybe even poor air supply and bad venting. Check all the vents and make sure there is nothing that could flood the heater from above. Once checked, double check to make sure the gas is on and the pressure is normal. In most cases, this means that the thermostat is just set too low. However, it could be that your heater is just too small for your pool or you don’t have an adequate supply of gas to the heater. In some cases, the high limit switch could be faulty and signaling the heater to turn off before it has heated the water to the desired temperature. On occasion you may just be running your heater when it is too cold outside. If this is the case, you will have to wait for warmer weather. When a heater cycles on and off before the water has reached the desired temperature, you usually have a water flow issue. This could be due to a dirty filter, a closed valve or even reversed water connections. Sometimes, this can be caused by the thermostat itself, requiring it to be replaced. Over time the chemicals you use in your pool to keep the water clean can damage the heat exchanger. This could also occur due to low temperatures in the winter. In some cases, you will need to replace the exchanger, but you could also just have a gasket leaking or a loose connection. Check the gaskets and the connections first before looking at more expensive repairs. This is often caused by condensation that builds up when heating water that is very cold. However, it can also be a result of a damaged internal bypass or excessive water flow. You may need to install an external pool heater bypass to reduce the water flow into the heater. Your heater could experience damage due to excessive heat and even emit dark exhaust when it is running. IF this happens, double check your gas pressure and make sure that you have an adequate air supply and proper venting. In some cases, it could be down-drafting or wind that causes this issue. To fix this problem, you will need to install a high wind stack. The same chemicals that can damage the exhaust can also begin to corrode your heater. When this happens, you could find rust in your pool when you have the heater running. In many cases, cast iron heaters are the cause of this problem. 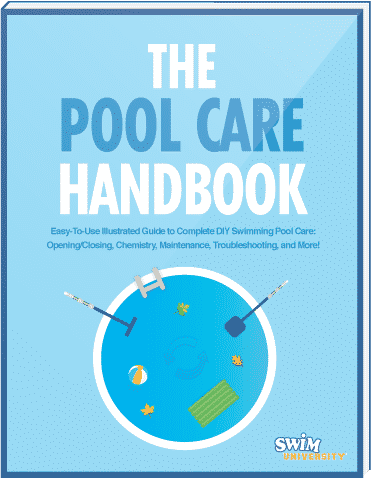 Check your chemical balance in your pool and you may have to replace the corroded parts in your heater to eliminate the problem. If all else fails, don’t be afraid to call in a professional. Remember, you are dealing with gas and if you are uncomfortable fixing the problem yourself or you just aren’t sure what is going on then you need to call in a professional. We love fixing things ourselves, but sometimes the repair is beyond your skill. For that, you will need to call in the pros. Swimming when the temperatures are cooling down outside is one of the best things about a pool. There is nothing quite like jumping into that warm water on a brisk day. If you have a gas pool heater, you need to make sure it is in the best shape it can be when the temperatures start to fall. If you do have a problem, in many cases you can fix it yourself so you can warm that water and enjoy your pool even when it is cool outside.